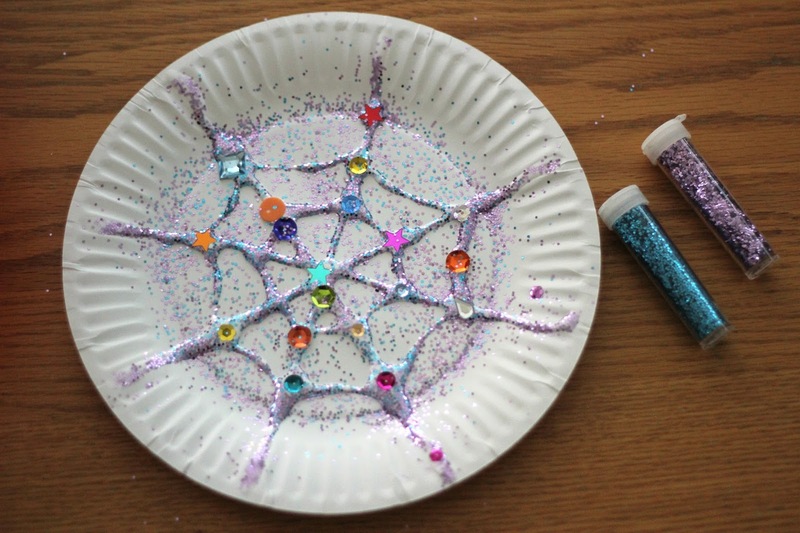 I hate glitter... but whenever I need an activity that will really get the kids excited and in a good mood, I pull out the glitter. This week is Spider Week for Virtual Book Club for Kids and we are featuring Eric Carle's The Very Busy Spider. 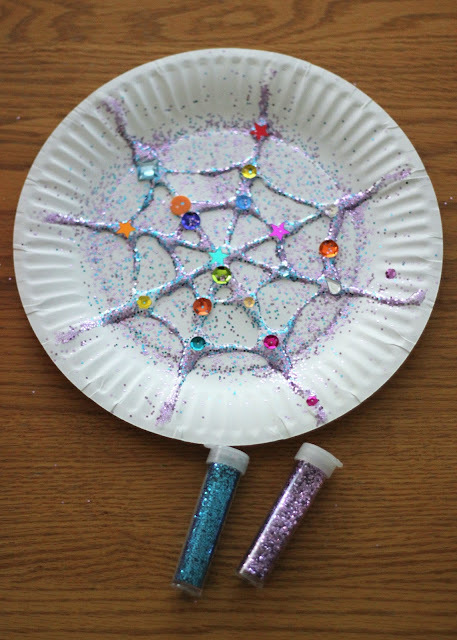 To get in the mood for Spider Week we decided to to pull out the glitter and glue and make a sparkly spider web collage. We also made a simple spider snack and a spider web sticky wall. To get started you need to draw a spider web on your paper plate with glue. My 5-year-old wanted to make her own spider web. My 3-year-old wanted me to draw him a spider web. Whatever works, is great. I tried to use up as much of the paper plate as I could when drawing mine with glue. 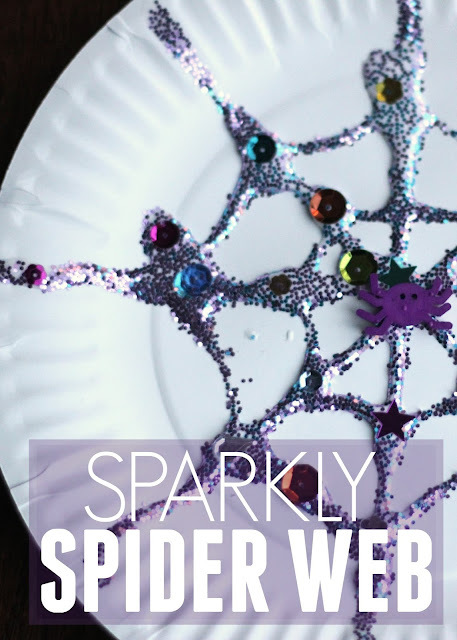 Next we grabbed our favorite embellishments and added them to the spider web. We used sparkly stars, sequins, and buttons. 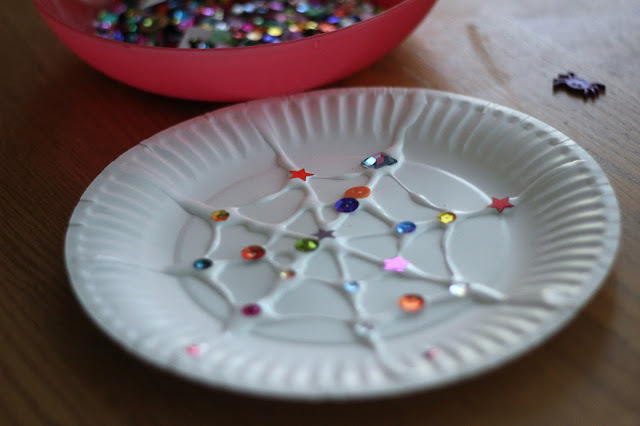 Finally, we grabbed out little containers of glitter and we covered the paper plate in glitter. I loved using several colors. 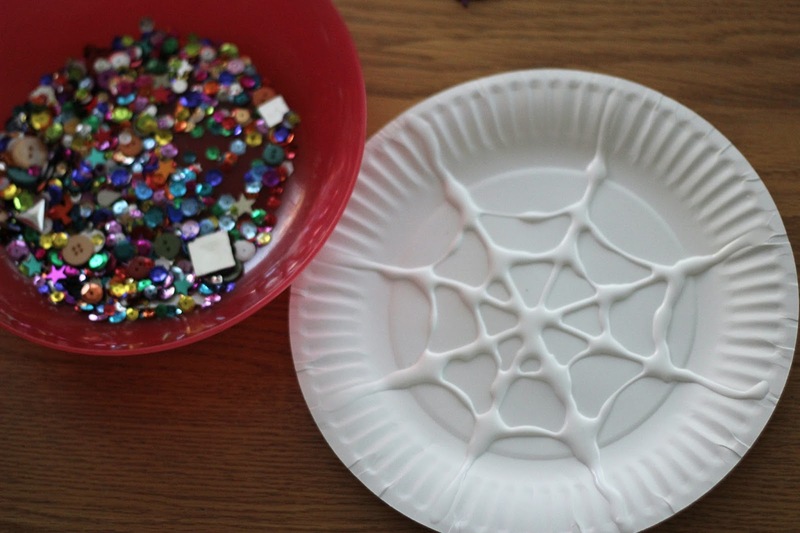 Once the paper plate was covered in glitter and all of the white glue was covered, we let the glue dry. Then we shook off an excess glitter into a large plastic ziploc bag (to be used again). Even though I hate glitter, it really is pretty. My kids are always completely mesmerized when we use it. To finish off the spider web we stuck a big purple plastic spider in the center of the web. 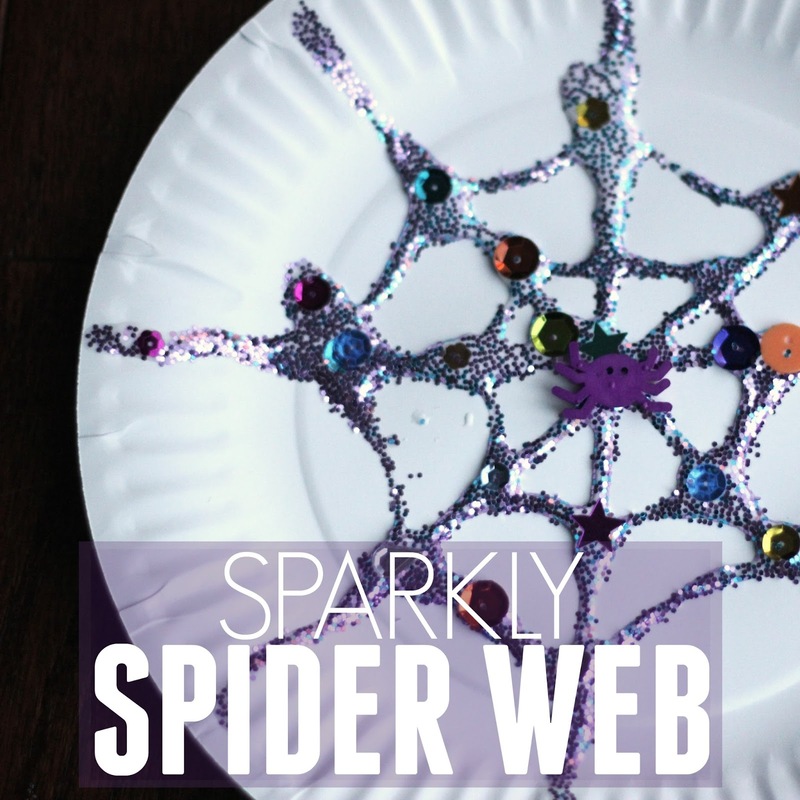 My kids loved the sparkles on this project and can't wait to try it again tomorrow! We are adding this one to our repertoire of spider activities. 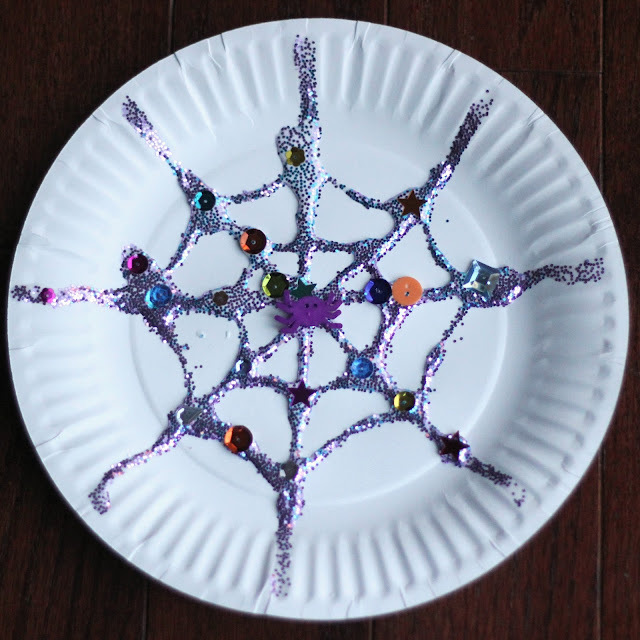 You can find some of our other favorite spider crafts and activities for preschoolers here. 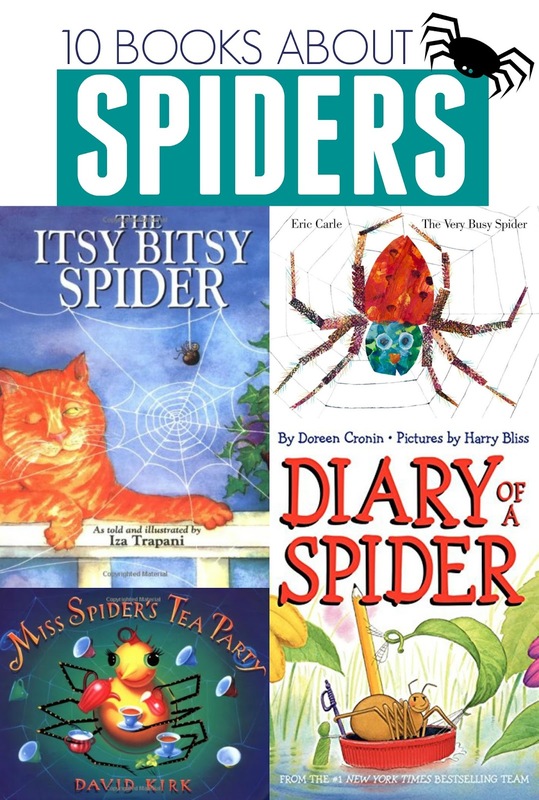 Do you have any favorite spider books of activities?